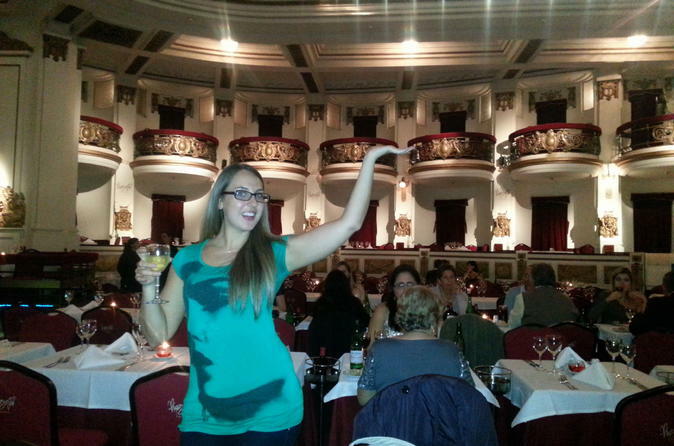 Enjoy fine dining, Argentine wine and a spectacular tango show at the Astor Piazzolla Theatre. During this 4-hour experience at Piazzolla Tango in the historic Guemes Gallery, learn about the history and culture of tango in Buenos Aires after an optional traditional Argentinian dinner. Enjoy complimentary hotel pickup and drop-off. Don’t miss your chance to see a tango show in the city where it originated! This Buenos Aires tango show is one of the best-priced options available—perfect for those on a budget. See tango Piazzolla-style at this traditional tango showcase with optional dinner. After pickup at your downtown Buenos Aires hotel, you'll be transferred to the Guemes Gallery, a historical building designed by Francisco Gianotti in the early 20th century. Admire the gorgeous interior of the Astor Piazolla Theatre, named after tango composer and musician Astor Piazzolla. Intricate wall designs and bronze sculptures grace the walls of this iconic hall where Piazzolla Tango has been performed for thousands of appreciative audiences. Dine on traditional Argentine empanadas and homemade ravioli if you choose the dinner option. Enjoy fine wine from Argentina's wine country and delicious desserts such as coconut pudding. If you don't opt for dinner, arrive at Piazzolla Tango just in time for the show. Appreciate Argentina's culture and artistry through the movements of the dancers and the sounds of the music. Your epic evening ends with drop-off at your Buenos Aires downtown hotel. The entire evening was delightful. Tango lesson, dinner, show and service were all first class. Really glad we booked this event. Fabulous evening from start to finish. Transport was excellent with driver on time for pickup and there to pick us up after show finished. The meal was good with excellent service and the tango lesson was fun but not mandatory. The tango show was excellent and highly recommend this tour....value for service offered. Our evening was wonderful. The transportation was stress free; our driver picked us up in a timely manner, and was waiting outside the theater after the show to return us to our hotel. Once at the theater all went well with good service, a nice meal, and free flowing wine. The show was terrific; we were so impressed by the dancers' moves and stamina. We'd recommend this event to others without reservation. No one knows to speak English I ordered a tour not in Spanish. It was very complicated to get the return to the hotel after the show. On the pick up and drop off though we had a very strange driver on the way back who did not know the direction to Palermo, did not have a GPS and relied on our GPS apps to give him guidance. Totally unprofessional. I would give this experience 3.5 stars overall. The Tango show itself is excellent but everything else - not so much. The email communication leading up to the show was very confusing. It asked us to be at the theater by 9:30 pm and drop off was included since we weren't staying at a downtown hotel. When we got to the theater, they asked us to pay 300 pesos for the drop off back to the hotel. The show doesn't start until 10:30 pm. It's about an hour and a half and the performers are the real deal not some kind of amateurs. We ordered Pisco sours and they were the worst ever. We couldn't even drink more than a sip. There are about 200 people watching the show including kids. Also, they should consider not allowing videos and pictures since most people obstruct the view for others and some brilliant folks use flash in a dark theater. After the show, the shuttle situation was a cluster and you need to factor in about an hour from the time the show ends to when you get to your hotel. What we liked in this tour: the show was amazing, not only the dancing but the music and the singers too. What could be improved: the timeline given was not correct, after arriving before 8pm at the theater, there is some time spent waiting, then a quick tango class, then dinner is served around 8.30pm but the show only starts at 10pm, which means that you are back to your hotel past midnight. Would we have known that we would have chosen a different evening as we had to get up early the following morning. This is a wonderful experience. If you're not interested in the tango lesson beforehand, you can skip that and go straight for the dinner and show. Top class musicians, very interesting rhythms, gripping dance performances and singing, displaying a wide range of different types of tango and emotions. Food was great and nicely presented. An evening well-spent. My mom and I signed up for the dinner show. We received a 45 minute window of time in which we'd be picked up from our hotel. They ended up coming 5 minutes after the latest proposed time which was a little frustrating since we had to wait in the lobby that whole time. I would definitely not recommend doing the dinner portion. The food was horrible. You'd be better off doing your own dinner before. Not to mention, we had to sit around for about an hour and a half after dinner before the show even started. Show starts around 10:15, which was not very clear in the description. The show portion was very good! The singing and dancing was outstanding. But the dinner and waiting around kind of ruined it for us. A truly enjoyable experience with transportation and an insight to local Argentinian nightlife and the love of all things Tango. We were picked up at our downtown loacated hotel and transportation was in a clean air conditioned van to a local dinner theater. We experienced a short Tango lesson and were then seated in an amazing theater space where a wonderful dinner with choices of entrees and beverages were served. The atmosphere was suitable to the experience and a dazzling performance started after the meal. Transportation back to the hotel and the evening was declared a success by all four of us. The only improvement on this tour would be a confirming email to the approximate pick up time at the hotel as we werent positive the pick up time. A first class experience.